Heating ductwork is an unseen part of your home but it has a great impact on the comfort level and temperature of your home. If your ductwork leaks air then you are not getting maximum airflow to all parts of your house. This can lead to some rooms being noticeably colder than others in the winter or hotter than others in the summer. 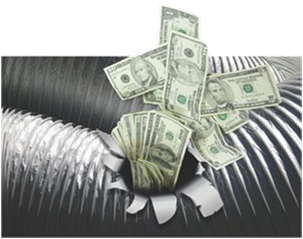 An even bigger issue, though, is the extra energy costs and the energy loss that occurs with leaky ductwork. You can check your heating ductwork for leakage in a couple of different ways. The most common method is to measure the airflow in each room to see just how much air is making it from the furnace out through the ducts. In older homes, it is not unusual to find that as much as 40% of heated and cooled air is lost through leaky ductwork. That is a huge number and one that makes going back and re-sealing ductwork seem appealing. The difficult part is how to go about accessing the ductwork in order to seal it. After all, it is located behind finished walls and is not readily accessible. There are two primary ways of sealing leaky ductwork. The first way is the most thorough way, but it is also the most expensive way - cutting through drywall to expose the ductwork and tape the joints securely. Many homeowners believe that sealing up leaky ducts with duct tape is a simple solution to their problems. However, this is not a good choice for sealing ductwork because it does not seal tightly enough. Instead, use specialty metal tape that does not get brittle over time. The second way to seal leaky ductwork is to higher a professional company to spray an aerosol sealant into the ductwork. This method is quicker and easier than cutting through your drywall, and you don't have to go back and do drywall repairs afterwards. Regardless of the method you choose, properly sealed heating ductwork is one of the best things you can do for your home. It will keep you more comfortable in your home and save you money on energy.